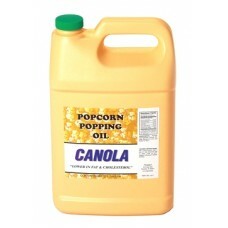 Paragon Canola Popcorn Popping Oil (1-Gallon Jug) - Paragon's Canola popping oil. Canola oil has low saturated fat, high monounsaturated oil content and beneficial omega-3 fatty acids. Compared with many other oils, Canola has one of the lowest ratios of saturated to unsaturated fat. Ingredients: Partially Hydrogenated Canola Oil, Beta Carotene for color and Butter for flavor.